The humble tie is an accessory that on face value, appears to be more form than function. By extension, this typically means it is reserved for more formal functions (pun intended); but to dismiss ties as unnecessary would be a great disservice. Ties often act as a centring piece of clothing that can complete an outfit. Some might say, (though the eye of the beholder is to judge) it adds considerable shades of charm to its wearer. However the modern necktie, a long piece of cloth that rests under a shirt collar and is knotted at the neck, has its roots in that of scarves and military purposes. Ties are descended from the cravat, which was created in the 17th century. Cravats were specially designed as a military garment that were used by the Croats; armed forces that were comprised of Croatians, Hungarians, and also Serbs, Albanians, Transylvanians. The Croat uniform consisted of fur hats and long red cloaks, as well as knotted handkerchief scarves around the neck, presumably used for both increasing body temperature but also for hygiene. When the Croats came into contact with the French during the Thirty Years’ War, (1618–1648) — the French were enamoured and impressed by their outfit. They soon adopted the scarf and named it after the Croats, which in French, translated to: cravate. And thus the beginning of the cravat and the necktie began. When the French returned with this new fashion, King Louis XIV wore a lace version of it in 1646 (at age 7) and proceeded to set the benchmark for French nobility but also for the rest of Europe. Men and women began to don pieces of fabric around their neck, mostly tied in place by strings or elegant bows. The art of tying a proper cravat had generated much interest, so much so that a series of publications were borne, educating the public on how to do this. This began with the wonderfully titled Neckclothitania, a book that contained visual illustrations and instructions on how to make 14 different variants. The immense skill that was required to tie these knots became a mark of a man’s elegance and wealth. Of course, the flip-side was that the complexity of such garments often resulted in clothing that was hard to maintain for the duration of a day without becoming undone. With the advent of the Industrial Revolution, people wanted neckwear that was easier to put on, was comfortable and would last the workday. Thus, the necktie became a much more accessible piece of clothing for the masses, and the relative simplicity in which it could be worn enabled it to be worn by millions to this day. Stylistically, ties have evolved with the time and era, notably in the patterns, colours, material and width that they are made from. Typically, wider widths were more popular in the past (think post World War and also Gordon Gecko from Wall Street) with skinnier/slim variants becoming the more accepted look of the modern necktie. Fabrics that are used for neckties can be seasonal, which means that summer ties are often made from lighter linen or cotton, and winter ties typically being made from wool. Silk ties are often worn all-year around, and funkier options for ties have existed too, including sweater knit and leather. Flat colour ties, checks, plaids, and stripes (thick or pinstripes) are often the classic staples for ties. Other patterns include polka dots and more illustrative options (think paisley or any kind of patterned novelty design), though these are rarer choices for those with more adventurous tastes. Typically however, four main knots are used today, and are known as the Four in Hand knot, Pratt knot, Half Windsor knot and Windsor knot. They are ordered in terms of knot width and complexity. Of course, there are still a huge number of ways a tie can be ‘theoretically’ done up. 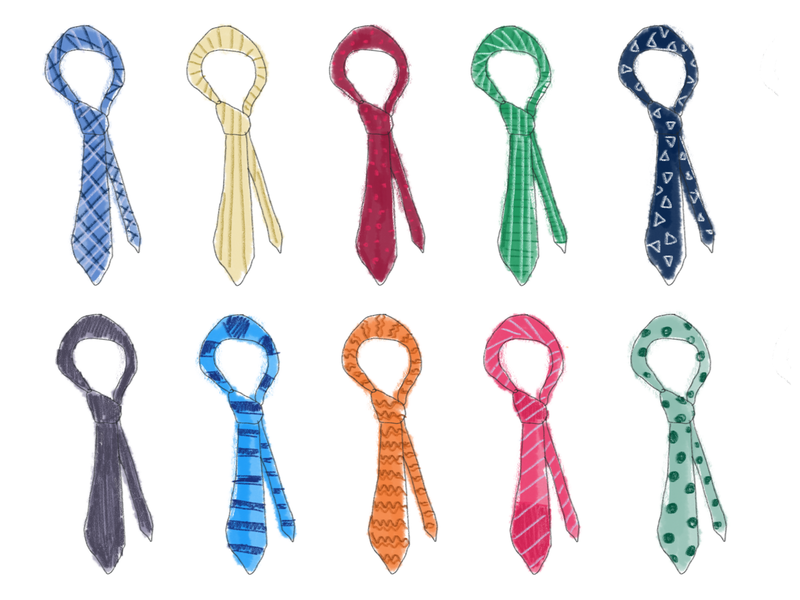 Two researchers, Thomas Fink and Yong Mao form Cambridge used a mathematical modelling system to prove that 85 different knots are possible with a conventional tie. An Atlantic knot is notable for being tied backwards, highlighting the structure that is usually concealed. Ties have fallen in and out of favour many a time. They are sometimes viewed as symbols of posterity and stuffiness and the anti-necktie sentiment being driven by tech startups and turtlenecks by a certain Mr Jobs. Ties are classic pieces that have endured for a long time and make wearing any collared-shirt ‘pop’. Wearing one feels really nice. Hanging fabric from one’s neck is really a lot cooler than it sounds. Believe.